Article by Luke Waterson ©. Posted in Resources (Plotting and Planning). Most fiction writing begins with a kernel – a nugget of an idea with the potential to grow, sometimes forwards, sometimes backwards, sometimes sideways, invariably into something that soon enough bears little resemblance to its humble beginnings. Historical fiction follows a similar but not identical process. Here, in some respects, the die is already cast; development is fuelled organically by the writer only between a series of known and unmovable points. Think of it like the creation of a tapestry: you have an idea of how the hotchpotch of many-coloured threads will interweave to achieve your vision, but you are obligated to work with a few balls of yarn you haven’t chosen – and perhaps, in an ideal world, would not have selected at all. The known, unmovable points – those balls of obligatory yarn – are of course the events already proven to have unfolded in history. Why would a writer not wish to work with them when the period is clearly one in which they are interested enough to have based a book around? Well, largely because they can be immensely inconvenient. For my new novel, Roebuck, the kernel was an article I’d chanced upon in a back copy of the Economist – a little piece on Anthony Knivet, the sailor and great-unsung hero of 16th-century New World exploration, who would become the protagonist of my book. His story is a captivating one: a member of crew on a privateering mission gone wrong, he gets abandoned on the unruly shores of Brazil and winds up living much of the next decade amongst the region’s then numerous tribes, eventually inciting them to revolt against the Portuguese. The reason the Economist (indeed any of the other handful of publications that ever mentioned Knivet in passing) touched upon the story, though, is most likely because of the diary the man kept. I realised that Knivet’s account – originally published in 1625 as the Admirable Adventures and Strange Fortunes of Master Anthony Knivet, which went with Thomas Candish Upon his Second Voyage to the South Sea. 1591, in Samuel Purchas’ mammoth collection of travellers’ tales, Purchas his Pilgrimes – would serve as my principal source if I wanted to lend Roebuck any legitimacy. No easy task when – despite providing many insights into Brazilian life in the 1590s that would otherwise have been lost forever – the account goes down as one of the most inaccurate, fanciful and contradictory testimonies to the era. I started to understand why writers – historians and novelists alike – had generally shied away from delving too deep into this man’s story. Whether via Knivet’s recounting style or through Purchas’ notoriously fallible editing, a resource that could have filled in so many blanks on life aboard an early privateering vessel and on the customs and culture of the soon-to-disappear tribes of South America often comes up short: offering glimmers but denying readers the vivid detail their appetites have been whetted for. There are a few other contemporary sources – and several other well-regarded later ones – which shine some further light on Knivet’s Admirable Adventures. But still, I was left with a canvas riddled with gaping holes. I wanted to remain as faithful to Knivet’s original diaries as possible, but remaining faithful to an account so inaccurate, so fanciful, so contradictory was problematic if I didn’t want to risk my own book falling prey to inaccuracy, fancifulness, contradictions. The solution became clear. My take on Knivet’s tale could not be tackled in a detached way, with a historian’s hindsight. The only people that had ever spoken up for Knivet before were historians, and they had kept him in his place – as a colourful but unreliable testament to the times. Yet the more I read about him, the more I was convinced Knivet was not a man who deserved to be kept in his place. Thus my approach had to be the very opposite of that. It had to be in first person. It had to be the in-depth account that there never was, or at least that was never discovered – with those holes filled in. That way, all the idiosyncrasies that it is intimated Knivet does possess from the original account could remain (or even be elaborated upon), and therefore so could the contradictions and flights of fancy: because they are exactly what you come to expect from the utterly eccentric narrator that emerges from the pages. The Anthony Knivet of Roebuck is the character I have imagined him to be – the only way I could imagine his character if we are to take everything he said in his 1625 version of events at face value. Thus my protagonist is not averse to the odd boast. He is a dreamer. He often fantasises and just as often brought so close to death, or intoxication, or extreme hardship, that his perception of reality – as anyone’s would be in similar circumstances – is questionable. He is hot-headed, too, and in the spirit of the adventurer of his age, sometimes veritably embraces danger. I have made Anthony Knivet like this, and a few other things besides. And of course, perhaps he wasn’t. Perhaps he was a meek soul who never touched a drop of alcohol and did his best to avoid confrontation wherever possible. But I prefer to think of him as the day-dreaming, often-intoxicated, long-suffering, hot-headed adventure-seeker. That’s how I believe he – were his voice to trumpet 490 years through the ages to tell me what the truth of the matter was – would have come across. Plus it’s a cracking good read this way. Meet Anthony Knivet: baker, translator, man of words and indispensable advisor to celebrated English generals and Portuguese governors alike… not to mention the kings of several Brazilian tribes…Roebuck is a swashbuckling Elizabethan adventure! Roebuck is based on the true story of Knivet’s escapades in South America during the 1590s, when desperate to prove his worth to his father and his betrothed, he embarks with Thomas Cavendish on the explorer’s ill-fated circumnavigation of the globe. Portuguese colonists capture him and want to hang him as a heretic and cannibals wait in the jungle with a hankering for his flesh. But Knivet is determined to carve a name for himself in this New World, despite the bizarre, unsavoury and sometimes just plain evil characters that stand in his way. Whether acting as interpreter elect for the sadistic Cavendish, confidant to the devout but dangerous Governor of Rio de Janeiro, or the guide upon which the entire Portuguese army comes to depend, he strives for the recognition he believes he is due. Finally, deep in the jungle, he does find his calling: inciting the tribes to unite, rise up against their Portuguese oppressors and thus change the history of Brazil forever. Meet Anthony Knivet: gentleman, baker, lover, linguist, explorer, Englishman. And an indispensable advisor to celebrated generals and Portuguese governors alike…not to mention the kings of several Brazilian tribes. 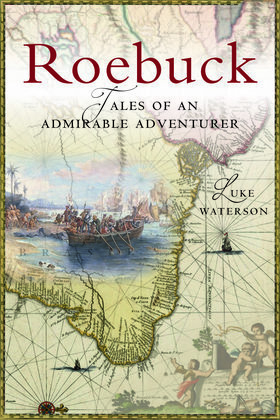 Roebuck – Tales of an Admirable Adventurer is a swashbuckling tale of the highest order, following Knivet’s escapades in South America during the 1590s. Desperate to prove his worth to his father and his betrothed, he embarks with Thomas Cavendish on the explorer’s ill-fated circumnavigation of the globe. Portuguese colonists want to hang him as a heretic and cannibals wait in the jungle with a hankering for his flesh, but Knivet is determined to carve a name for himself in this brave New World, despite the bizarre, unsavoury and sometimes just plain evil characters that stand in his way. Whether acting as interpreter elect for the sadistic Cavendish; confidant to the devout but dangerous Governor of Rio de Janeiro; or the guide upon which the entire Portuguese army comes to depend, Knivet single-mindedly strives for the recognition he believes he is due. 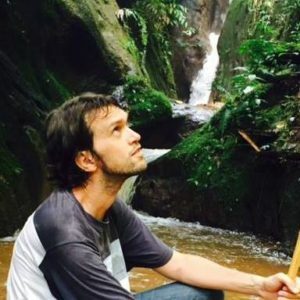 Finally, deep in the Brazilian jungle, he does find his calling: inciting the tribes to unite, rise up against their Portuguese oppressors and thus change the history of Brazil forever. Inspired by the true story of Anthony Knivet’s 16th century expeditions through South America, Roebuck is a thrilling historical adventure and the stunning debut novel from celebrated travel writer Luke Waterson.